The aim of the game is pretty simple. Guess the ridiculous sound the other person is making to get the points. And though the aim is simple, it doesn't mean it's an easy game because you're not allowed to use your hands or any words - JUST SOUNDS. 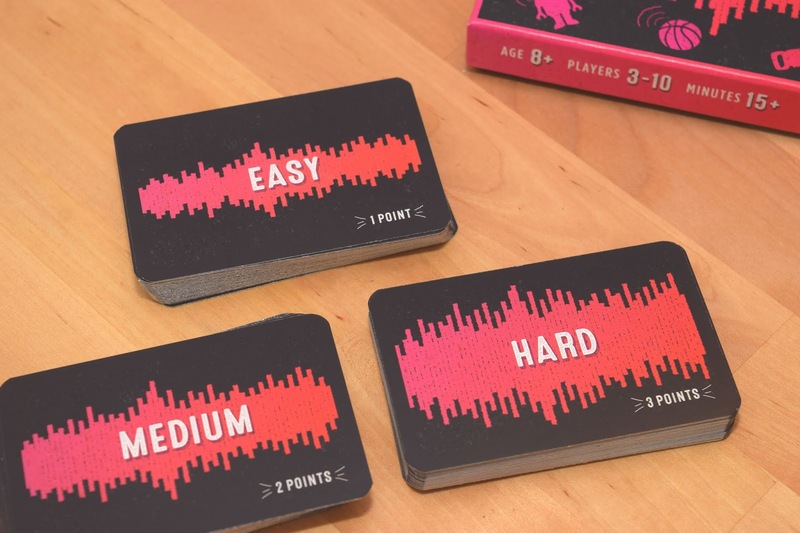 An easy sound is one point, medium is two points and a hard sound guessed is three points. 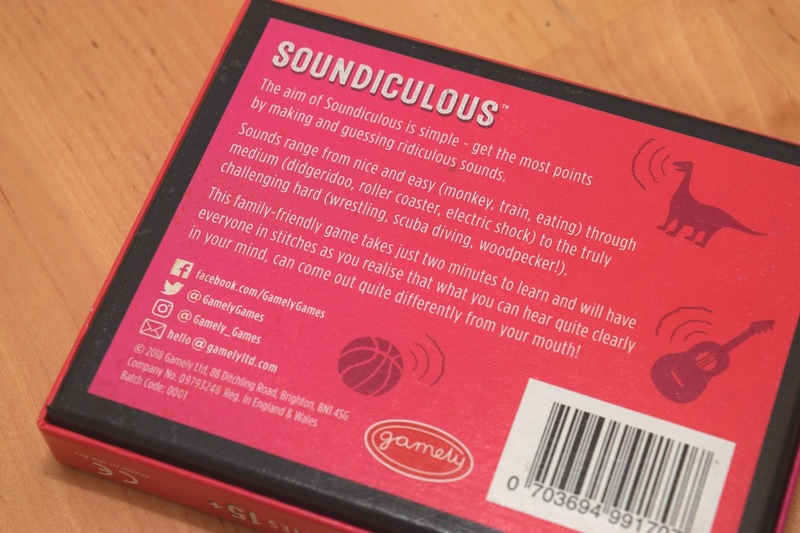 Both the person who guessed the sound and the person making the sound gets the point when it's guessed correctly. The only other thing you can do is nod if someone is getting closer to the sound being guessed. In the box you get a stack of easy, medium and hard cards. 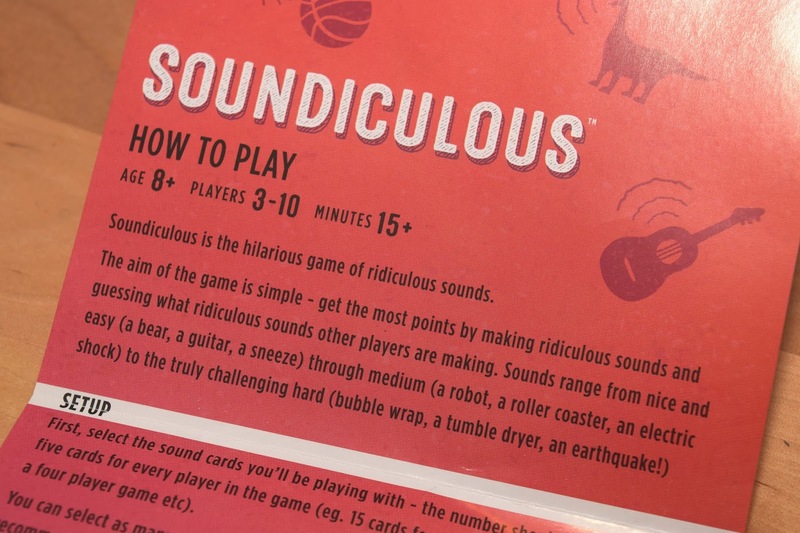 As well as that, you have a set of instructions that answers any questions you might have about the game and how to play. As well as the cards, the only thing you need otherwise is 3 players or more and a way of keeping score. We used pen and paper. It's everyone for themselves in this game so there's no teams! My favourite sort of game lol! 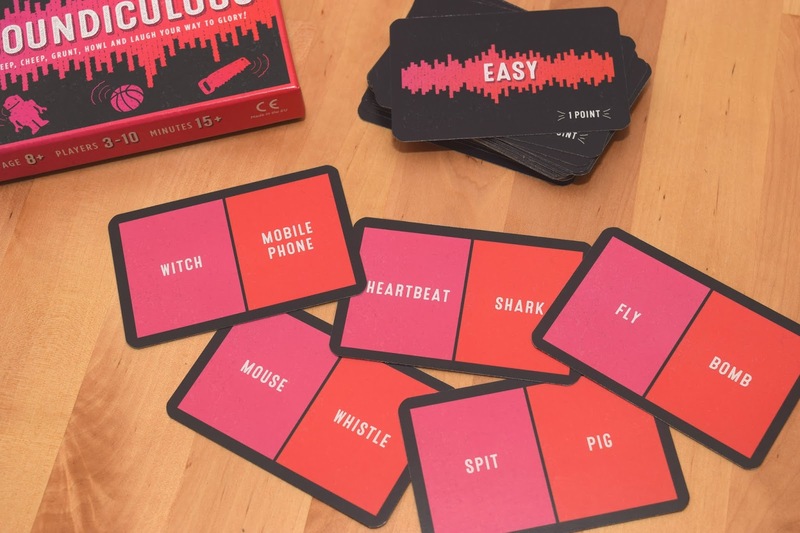 As you can see from the cards above, the sounds are pretty easy to replicate from the easy section but become increasingly difficult as you move through the levels for higher points. (duh.) 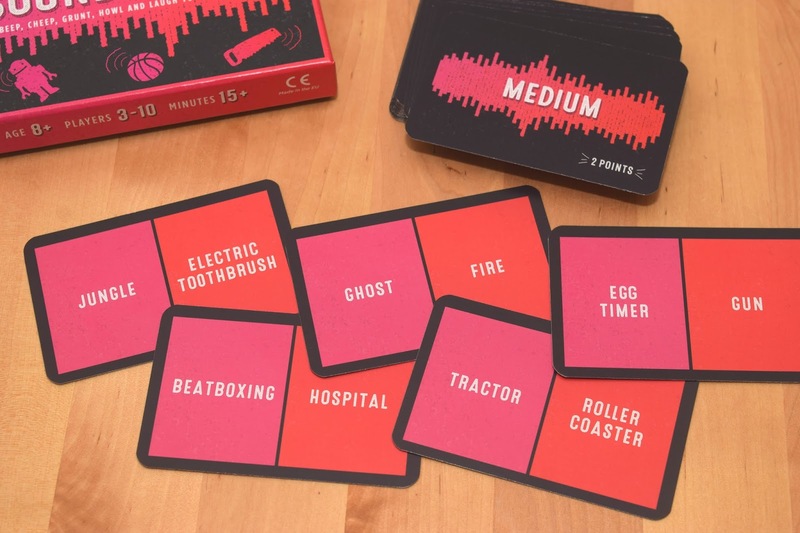 But if you have a look at those medium and hard cards and start to think about how you might make those sounds with just your mouth you start to become stumped. Out of the ones you can see here, I think I'd easily be able to replicate the sound of scissors, a microwave and beat boxing but I'd be stuck at making the sounds of a roller coaster, snooker and a phoenix! 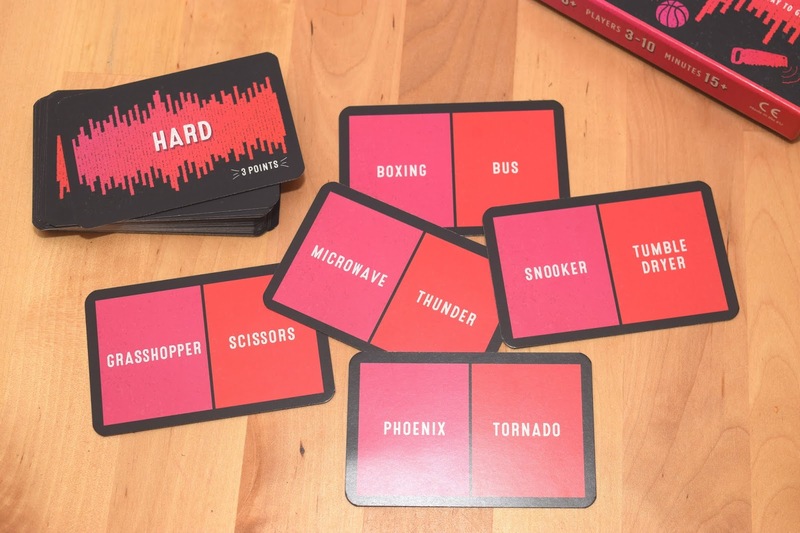 Though there are two sounds per card and at the beginning of the game you choose which set of sounds you're going to play: left (pink) or right (red). So that when you play next time, you get different sounds and you can keep switching it up. I played this game with the family when they came over to our new house and it was a bundle of laughs! So much so I was so busy playing I forgot to take photos of our game play! (I so wanted to win.) Everyone trying to make sounds and guessing was pretty hilarious and at times slow because we were confused at what sound it was! Though it was noisy game, it was loads of fun and I'd totally recommend this. I didn't win but I think I sure made a good effort at trying. Thing is, I had so much fun that I didn't care I didn't win even though I'm a sore loser! Haha! It's a perfect game for all the family so whether you've got children or you're all adults - you can all play together. It's truly a game for everyone. I actually told some friends who are still due to come around about the game and they're looking forward to playing it after having played Randomise before. 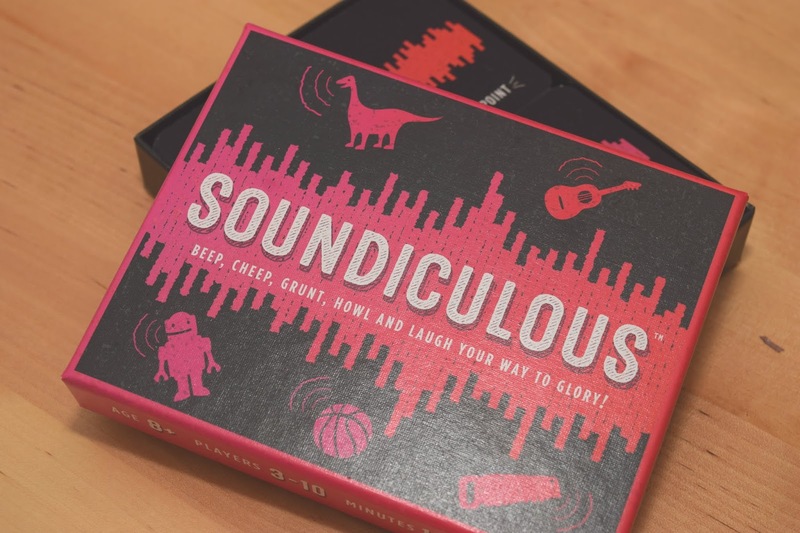 So hopefully in the next few weeks we can have another gathering playing Soundiculous and Randomise with drinks and finger food. My favourite sort of gathering! 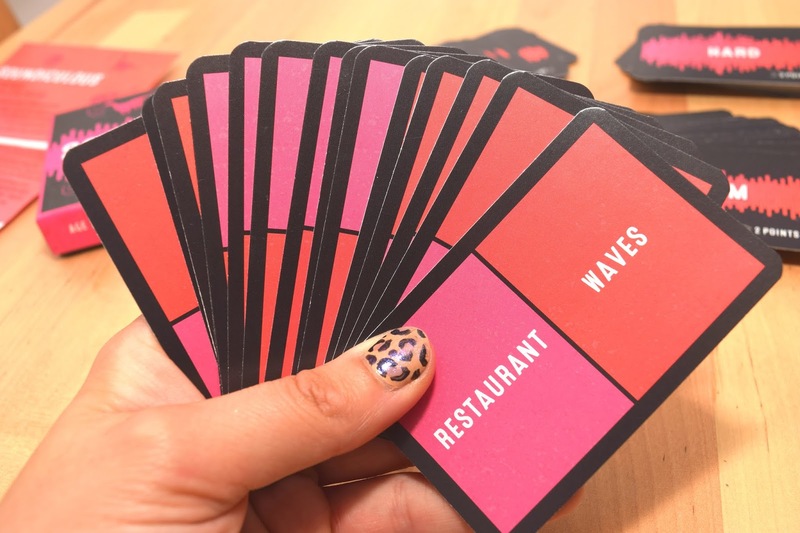 Would this be a game you and your family enjoy on a games night? If it's not for you Gamely, the creators of both Randomise and Soundiculous, have another game they've released called The Pretender which also sounds like a lot of fun. I might have to get it because it sounds so brilliant too! 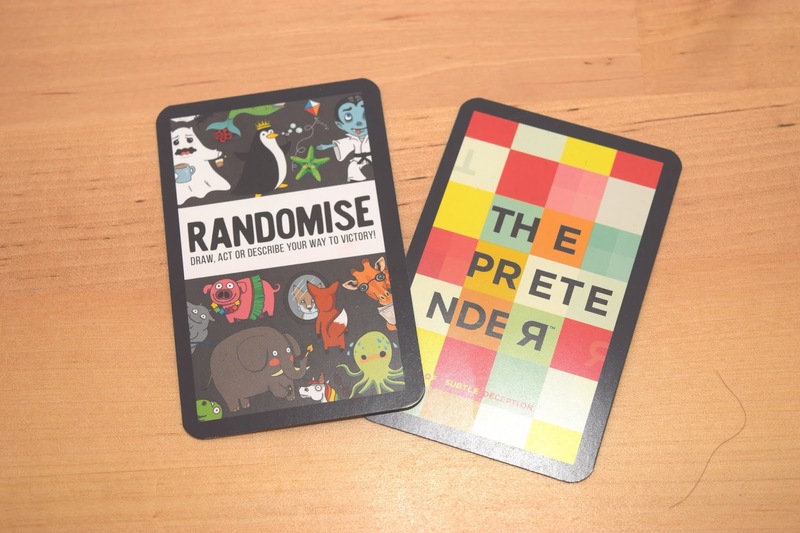 If you'd like to buy Randomise, Soundiculous or even The Pretender you can find them all on Amazon now for £11.99 each! This game sounds hilarious! We are hosting Christmas this year so I think this will have to be added to the after dinner games! I think you should! It's so much fun!